Do you know what is Aadhar Card? Little Confused? – What is Boi-metric? Thinking About Applicant Privacy Right? Govt. of India introduce a new Identification System by the name Aadhar Card. Hope you heard about UIDAI!If you only heard about UIDAI and don’t know much about this. We are here to help you to give you brief details.UIDAI is the short form of Unique Identification Authority of India. This manages Aadhar Applicant info & handle this project under Central Govt. UID AADHAAR launched in January 2009 in India… Since Jan 2009 UID established Aadhaar Card Center in all over India.They placed their main Data-Center in “Manesar” (A Place in Haryana). Don’t worry – If you don’t know! This is an Identity Card with Unique 12 digit Number which called Aadhar Card Number. This also contains other details such as Name, DOB, and Address. Please don’t be amaze… If I say that it helps in Safety & Security of the Country. Now, you must be thinking “How it is possible”. But Govt. is taking help with this as it also contains Boi-metric of the applicant with other details. Again don’t worry! As I am telling you what is “Boi-metric”.Bio-metric system store fingerprint & retina scan information of the applicant.Thus, this is very hard to temper it and having two Aadhar Number for one person. It makes very easy to track a person.This is how – it is helping in safety & security of the nation. Now, you might be thinking about “Privacy” of the applicant.Because, if you are having “AADHAAR CARD” that means… The government has records of your Finger Print & Eye Retina Scan with other details.“Well, I would not share my opinion on this. As Supreme Court is already having a petition on it.“Right to Privacy” has become a fundamental right for all the Indian.After the Supreme Court nine bench Judgement. The Judgement was pass with 9-0.All those 9 judges agreed to make “Right to Privacy” as a fundamental right after listing the hearing.But, this not mean that “Aadhaar Card” is an unconstitutional program and Govt. will stop it.The Supreme Court has still a matter pending on this – To made “AADHAAR” Compulsory or not.As per the Indian Government aadhar should be compulsory for all the citizen.When we see fundamental “Right to Privacy” right we cannot say that Aadhar Should be mandatory for all.So, that is why Supreme Court & Govt. has not made the Aadhar mandatory for all. If you want to read more about “Right to Privacy” fundamental right. You can log on “The Wire” website as they have covered this topic completely. Benefit & Necessity of Aadhaar Card? First of all, you need to find an Aadhar Center nearby you. You can locate it online by visiting the Official Site. STEP 2: You can take Appointment Online or Even you can go without an appointment to Aadhar Center. STEP 3: On the visit of Aadhaar Card Center. You need to fill Enrollment Form. Click Here to download Aadhar Card Enrollment form. You can Print Enrollment Form & Fill details. Submit the Enrollment form with Supporting Document at Aadhar Center. Complete your Bio-metric. Once, you complete all these activities. Acknowledgment Receipt carries some very information like Date/Time14 digit Acknowledgement Number which helps you to check aadhaar card status online. Provided Data will verify by UIDAI. After verifying data they will assign you an Aadhaar Number. It will take 90 days (3 Months) to send your Aadhar Card to your Address. If you do not receive your aadhar at your Residential Address. You can do aadhar card status inquiry online. When you check aadhar card status online by name or receipt number… and found it. Then, you can do e aadhar card online download. We know that it seems a little difficult. “No Problem” – let me tell you How to check your aadhaar status… You may Check aadhar card status by name or by Acknowledgment Number. Now as you have got your “Aadhaar No” or “Enrollment No”. You can go ahead with UIDAI aadhaar card download. Please follow the next steps. STEP 4″You will get an “OTP” on Registered Mobile Number. Enter “OTP” and Confirm & verify it by clicking on “Validate and Download” button. You are ready to Download Your E AADHAAR Card. Or You can also take aadhar card print out. If you have your Enrollment Number. Then you can Check the Status straight away. But, if you have lost the Acknowledgement Receipt or Aadhaar Card. Then, you have to retrieve it by following this step. If you want to more elaborate on this topic. STEP 2: Select Any 1 Option: “Aadhaar No (UID)” or “Enrollment No”. Which one do you want to retrieve Aadhar or Enrollment No? Now Enter Your Full Name. Then, Enter Your Registered Mobile Number. Enter “CAPTCHA” (Security Code) as shown on Screen. Click on “Get OTP” button. OTP will deliver on your Registered Mobile Number & Email ID. In some time you will receive “Aadhaar” or “Enrollment” Number. As per the Option Selected in Step 2. STEP 2: Click on “Check Status-Update Done Online” Link. STEP 3: Enter “Aadhar Number”, URN(Update Request Number), OR SRN(Service Request Number), Enter “Text Verification” and Finally click on “Get Status”. Aadhar updation is one the of frequently used service due to a name change, address update, the wrong date of birth, update mobile number and many more issues, so many people want to update aadhar card details. 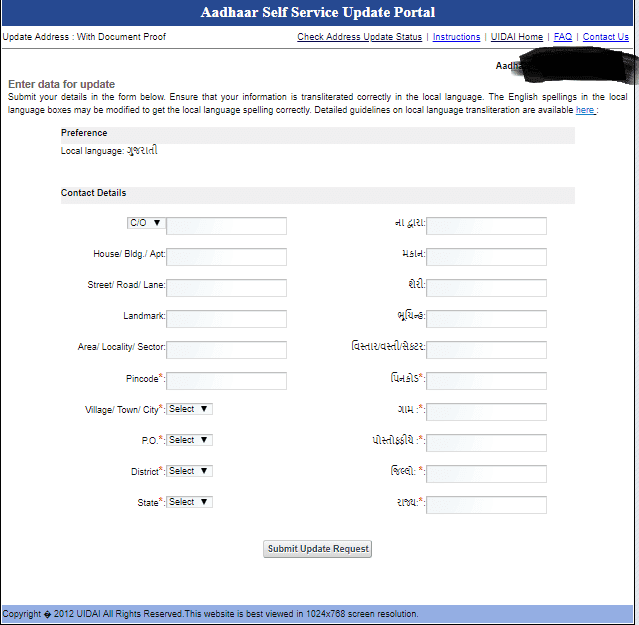 earlier you can online update name, dob, mobile number, address but due to security reasons right now you can only update address but if you want update name, Date of birth(DOB), mobile number so you have compulsory visite nearest aadhar card service center here we will guide how to update aadhar card address online. consider you are shifted to Mumbai city and you want to update address so you have compulsory one government document(Voter ID, Passport….) of Mumbai city so you have uploaded this document, that means you have a compulsory valid address for that we will be shown you step by step details below. STEP 3: Enter Your Aadhr Number Or Virtual ID number(VID) as per your choice, enter the text verification code and click send OTP Button. 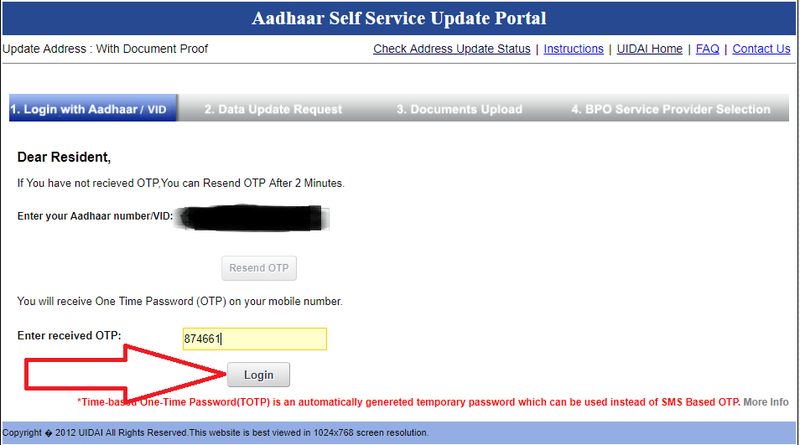 STEP 4: You will Receive one Time Password(OTP) on registered mobile number enter this otp and click Login Button. STEP 6: Enter your new address(That you want to update) house number, street, area, locality, Pincode, district, post etc and click on submit update request. STEP 9: Now you cloud see confirmation dialog click on yes. STEP 10: Select Kary-KDMS Database and click on the submit button. How to Lock and Unlock Aadhar Card Online?